We’re seeing more and more RESAR Online Review members using the RESAR online quizzes. It’s inspiring to see how their persistence is paying off. At first, their scores are low, but over time, their online quiz scores keep going up. We haven’t seen any official announcement from the PRC regarding when they will hold the next Real Estate Brokers’ Licensure Exams. Some people are saying it will be on Sunday, January 29, 2012 but still… we have NOT seen an official PRC announcement. In spite of this, people are joining the RESAR Online Review early. They are exposing themselves to the real estate materials early, and are answering the online quizzes as many times as they want. Lesson #2: Practice Builds Confidence. 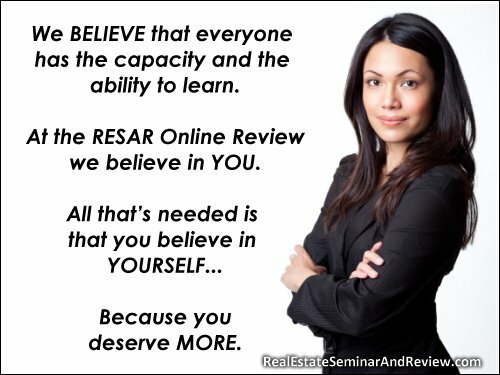 As you repeatedly practice with the RESAR Online Review, you will become more familiar with the materials and the real estate concepts. Then, when you go and attend the face-to-face Comprehensive Real Estate Seminar and Review or CRESAR sessions, you will feel comfortable because you will understand what the speaker is talking about. Yes, even if the speaker talks fast, makakasabay po kayo. Lesson #3: If You Want To Earn More, Learn More. Yes, you need to invest in yourself. When you have more information and better preparation, the sky’s the limit. While it is true that persistence plays an important role in any successful endeavor, arming yourself with the needed tools (e.g., information, learning skills, memory tactics) will help you even more. [From the Admin] Hi! What you need is 120 hours of a face-to-face review. For more info, please send an email to REBReviewClass@aweber.com Thank you. can a non-filipino citizen become a real estate broker or agent? what are the requirements for a non- Filipino to become one? [From the Admin] Hi! You need to be a Filipino citizen, a college graduate, and have earned 120 units in real estate subjects before you will be allowed by the PRC to take the Real Estate Brokers’ Licensure Examinations. Thanks! its included in the TOS madam. The appraisers exams yesterday was hard, especially for part 1. Parang hindi fundamentals kc u have to think deeply for u to interpret and analyse the question. Dun s TOS, pag fundamentals you have to name, state, define recall but after u have analyse and interpret for a longer period of time saka mo lng maisip and answer. d b pag fundamentals, basic knowlege of the subject known to everyone. Puro analysis at interpretation ng fundamentals ang lumabas. masyado marami questions pang professional practice na. Marami din hindi kasali like carper law, property laws like pd 957, bp 220. agri law, family code. Pero ang galing ng questions kaya lang mahirap intindihin. Masyado maganda ang dating, d mo naman masagot ng tama kc nga parang made in US ung tanong. Ganda ng construction ng quaetions. Good job by the PRBRES but not godd for the xaminees. Hindi sinunod and TOS. Sobra-sobra dami questions ng appraisal theories, principles at metjhodologies, ivs, uspap, pvs. 2 questions lang yata ang geography, natakot cguro s ecology. May question din n made in china at ibang bansa. Kahit nag-review k ng husto s hirap intindihin ng mga tanong san makapasa pa rin. [From the Admin] Thank you for sharing… We have some questions: Aren’t PD 957 and BP 220 topics which are covered in the Real Estate Brokers’ Licensure Exams? Does that mean that your RE Appraisers Exam review service providers still gave you materials about PD 957? Anyway, maraming salamat po uli for sharing.